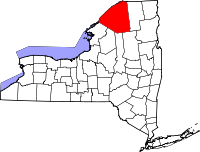 St. Lawrence County is, by far, the largest county in New York State as far as overall land area. The county is bordered by the river of the same name to the north, on the other side of which is Canada. The town of Canton, NY, which is the county seat, is home to the office of the County Clerk, the official repository for a variety of records for the county including property, naturalization, and County and Supreme Court records, both civil and criminal. Marriage records, along with birth and death records, are handled by the clerk of the town or village where the event took place. The County Clerk website provides a listing of all town clerks who maintain vital records such as those, as well as their contact information and location. Many individual towns in New York State have their own historians, as well, and the list the Clerk's website provides contact information for them, as well, when available.